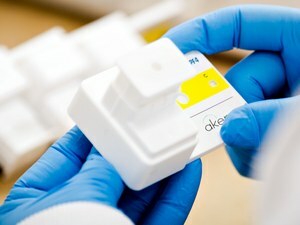 THOROFARE, NJ--(Marketwired - Mar 2, 2016) - Akers Biosciences, Inc. (NASDAQ: AKER) (AIM: AKR.L), ("Akers Bio" or the "Company"), a developer of health information technologies, announces the receipt of an order valued at approximately US$2,500,000 from NovoTek Therapeutics Inc. ("NovoTek") to supply PIFA Heparin PF4/Rapid Assay products in Mainland China ("China"). The order will be fulfilled in tranches throughout 2016, with initial sales anticipated prior to the end of the first quarter. The China Food and Drug Administration ("China FDA") recently approved the Company's rapid tests for allergic reactions associated with the widely used blood-thinner, heparin, for medical use throughout China. NovoTek, a Beijing‐based pharmaceutical and medical device company, holds the exclusive sales and marketing rights for the Company's PIFA Heparin/PF4 Rapid Assay products in China. The Company's PIFA Heparin/PF4 Rapid Assay and PIFA PLUSS PF4 version (which tests whole blood) are the first and only tests of any kind for PF4 antibodies (associated with the condition known as heparin-induced thrombocytopenia ("HIT")) to be available in China. PIFA Heparin/PF4 Rapid Assay and PIFA PLUSS PF4 remain the only US FDA-cleared rapid manual assays that quickly determine if a patient being treated with the blood thinner heparin may be developing HIT. This clinical syndrome reverses the heparin's intended therapeutic effect and transforms it into a clotting agent. Patients suffering HIT are at risk of developing limb- and life-threatening complications, so the timely test result provided by the Company's Heparin/PF4 devices is paramount to effective, clinical decision making. "The China FDA's approval of our test paves the way for Akers Bio and NovoTek to establish the PIFA Heparin/PF4 Rapid Assay devices as the gold standard for HIT testing throughout China," said Raymond F. Akers, Jr. PhD, Co-founder and Executive Chairman. "Our partner, NovoTek, is developing a complete solution to manage HIT in the Chinese healthcare system by having the exclusive licenses both for our test as well as for a treatment for those patients who have been diagnosed with HIT." "We look forward to fulfilling this order and to working with NovoTek to build what we believe will be an increasing flow of business for the Company over the coming years," added Dr. Akers.